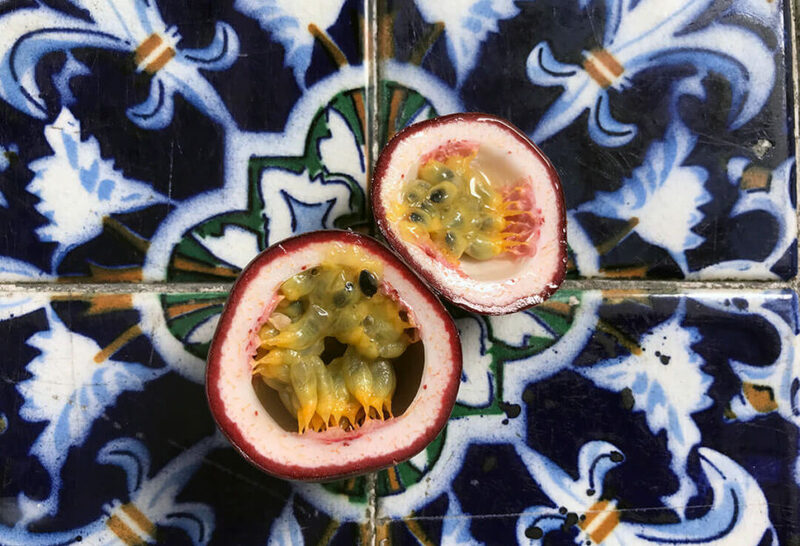 Maracuyá, also known as passion fruit in English, is one of the many exotic fruits of Mexico. It is grown in the tropical and semi-tropical regions of Mexico, like Oaxaca and the Yucatán Península. It is native to South America, originating in Brazil, and there are different varieties. In Mexico, the yellow- or purple-skinned varieties are the most typical. Inside the hard and somewhat crusty looking exterior, that is easy to open by either breaking with your hands or slicing with a knife, there are crispy deep black seeds covered with a yellow coating. That yellow coating covers the seed and it attaches to the inside of the peel. The yellow coating goes from the very light yellow to the almost orange as it gets closer to the peel. You eat it all, except the peel. The seeds are crunchy, and the flesh is very soft, a bit slimy, and juicy. The taste is a tad bitter, very citrusy, teasingly sweet and overall delicious. In Mexico, we love eating them just as they are, but it is also popular to make soda and agua fresca (especially in Oaxaca!). Passion fruit is used in dishes from savory to sweet. Alex Ruiz, a fabulous chef from Oaxaca who came to cook with me at the Mexican Cultural Institute here in DC, used it to make a jam-like concoction for a fresh ceviche. It was divine! It is also used in tons of desserts and drinks. From breakfast (over yogurt, with cereal), to lunch (jams, spreads, a sweet and sour addition), to smoothies and drinks all day long. And as you can guess… it is super nutritious! Full of vitamins and fiber and has a good dose of phosphorous, potassium and magnesium. It also has a high water content. Increasingly, you can find passion fruit in regular grocery stores, aside from Latino or international markets. You want to look for the ones with a smooth skin and a deep yellow or purple color. Unripened fruit will have green spots, and older fruit will have a bit of wrinkled skin. To remove the seeds, all you need is a spoon. I am a fan of eating it all by itself.